Description: Typically used where steel carrier travel exceed the system's self-supporting length, KabelSchlepp Support Rollers are capable of being used in the most adverse circumstances. KabelSchlepp's rugged, maintenance free support rollers are high quality, completely sealed design which utilize large tapered roller bearings for increased capacity, life and reduced vibration. 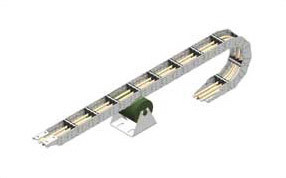 Support rollers should be placed in a stationary position, per KabelSchlepp design guidelines to increase the cable and hose carrier's total travel capabilities. All support rollers come complete with primed (gray) mounting brackets (see diagram) on which the mounting brackets are affixed to the mounting surface which is the responsibility of the customer.